So, we bought a new glider chair for little girl's nursery. If you've been following along, you'll know that this chair and it's potential existence has been quite the saga. The issue was basically whether or not to use HDawg's glider or buy a new one for June. When I first mentioned our dilemma here, most of you suggested that we pass on the glider from H to LLJ and get him a loveseat or big chair of some sort. You guys are the bomb diggity, so of course we took your advice and planned to do exactly that. It seemed like the perfect idea since we plan to use H's large room as a combination bedroom for him/playroom for both kids. A big ol' sofa sounded great in there and then the comfy PB glider could reside in LLJ's nursery. So that was the plan. I shared some pics of the nursery's new rocking nook where I used our old Eames rocker as a placeholder for H's glider. Once LLJ was born, we moved H's glider into her nursery, putting the plan into action. Ummm, it didn't fit. Seriously. The big ol' chair was... well, too big for her tiny room. We left it in there for a few days and could barely function or move around the room because the chair was so big. Crap. Picture this- I'm a few days home from the hospital, exhausted, hormonal and nursing my new baby at all hours of the night in that terrible plastic Eames chair. Mhm, it was time to get momma a new comfy chair. Which sort of worked out because we learned really quickly that we (and HDawg) really missed having his big glider chair in his room. I'm not sure that we would have found an inexpensive sofa that we liked as much for his space. So, David and I finally sucked it up and realized the reality that we needed to buy two gliders. After many late night nursing shopping sessions (those are dangerous, right?! ), I decided on this glider from Babies "R" Us. Since the ultimate restriction was that we needed an inexpensive piece, we went back and forth between a simple wooden nursery glider and something upholstered. Upholstered was the preferred option, but we had to find a deal. Finally, we struck gold at Babies "R" Us of all places. 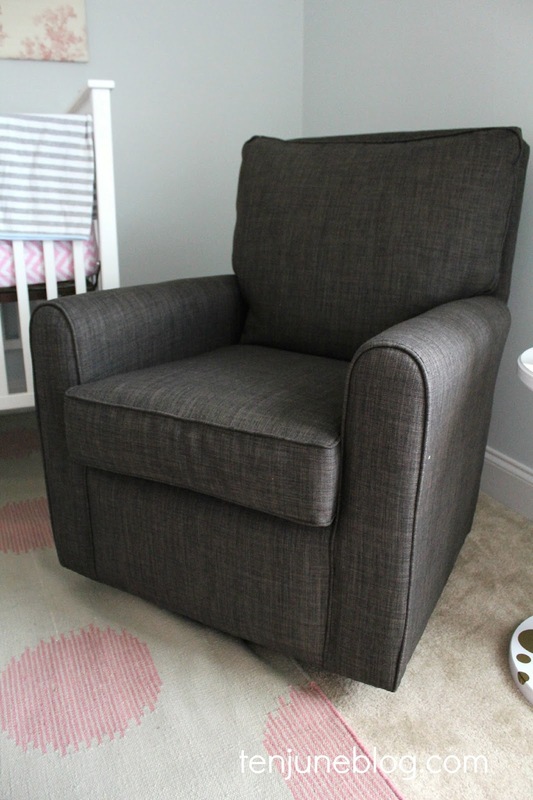 I didn't plan to choose a dark gray rocker, but this chair was a really good deal (we got about $125 off of the sticker price with a sale and a coupon so the chair rang in just under $300) and we feel like it's slightly modern shape and versatile color will easily fit into another room down the road. I think it would be really pretty in our master bedroom one day, perhaps? Long story short, we are now the proud owners of two nursery gliders. We tried to avoid spending big money on two "baby" pieces by planning to purchase more versatile/non-baby pieces like the sofa for H's room, but that's life! Especially with two kids under two. In the end, we love this glider in Little June's nursery. 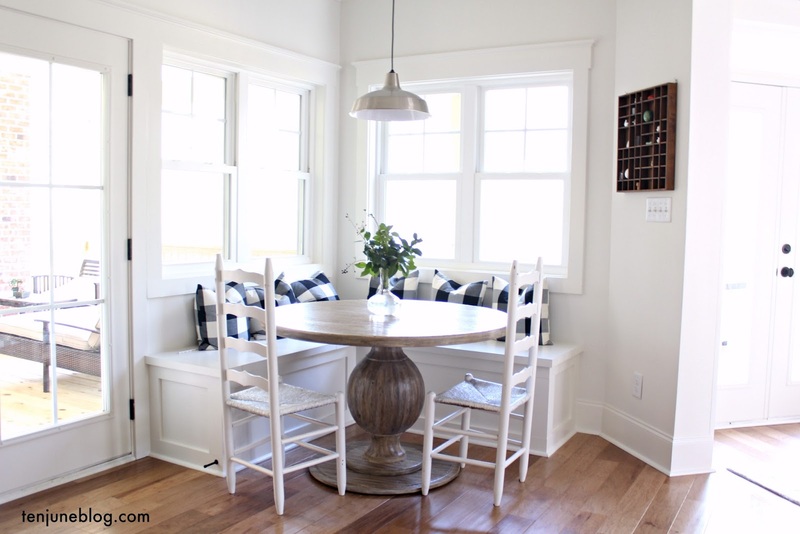 It has a much smaller profile than H's big fat Pottery Barn glider so it fits the room well. It's also really comfortable! I plan on doing a full reveal of her nursery next week (finally!) 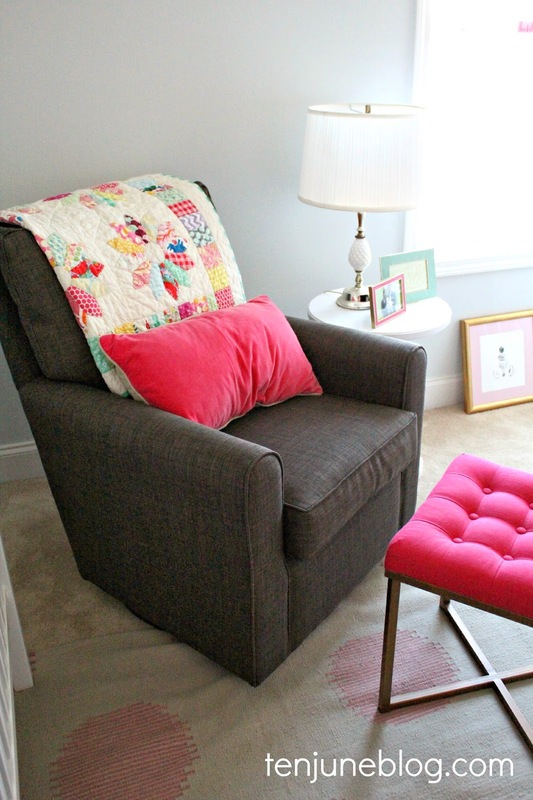 so you'll have to wait until then to see the chair all decked out in the nursery. Okay fine, you twisted by arm. Because I love y'all, here's a sneak peek of the new chair in the room. Ohhh yeah, I love it! OH I love it! Great pick between the profile and color...I definitely think you can use it more down the road too! Way to go! Love this chair!! I won't even tell you how much we spent on our glider which my toddler has just drawn all over with sharpie. Gulp. Great find and price! !